My review of last week's episode: Confection. "Do you think a golem's wandering around Oxford?" Alas, there's not. There's usually a wild card episode in Endeavour seasons, but Degüello doesn't quite live up to the promise of that dialogue! That said, it's one of the most satisfying conclusions the show has produced in a while, largely because it feels like, well, a conclusion. I've been talking about how much this season has been drifting towards becoming Inspector Morse. This episode,however, takes an abrupt about-turn to embrace its optimistic Endeavour spirit. I really ought to mind. But somehow, I can't. The show has earned it. These characters have earned it. Should the season have a happy ending? Probably not. Did I enjoy it immensely? Absolutely. Chief librarian Osbert Page is bumped off while searching the library for stragglers before closing. 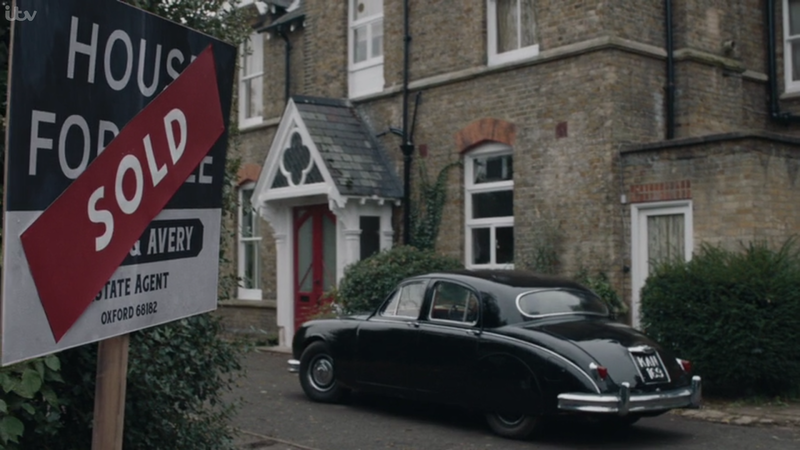 At his flat, Morse finds a map with the words anemoi (Greek for "the wind gods") and "H.B." written on it. Clues abound at the crime scene itself, from muddy footprints, to a scrap of Hebrew writing, to a book recently checked out from the obscene collection. The book was checked out by Dr. Jasper Nicholson, who seems to be the target of an intimidation campaign, receiving more written Hebrew phrases, a clay figure, and a name scrawled on his blackboard: Dora. Taken together, these clues evoke the Hebrew legend of the Golem, a clay giant animated by written words placed into his head (and a major plot point in a Terry Pratchett novel - this is the episode where they should have referenced Sam Vimes). 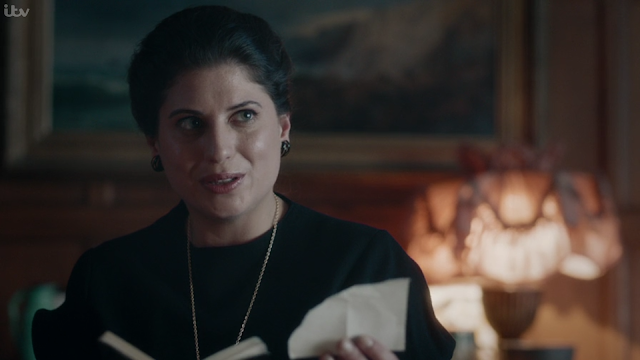 The investigation takes Morse to the door of Deborah Teagarden, a German Jewish woman whose uncle and his family were killed in the Holocaust. Somehow involved, also, is Professor Burrows, a cheerful old man who is just a little Too Helpful To Be Innocent. He's good, but Aidan McArdle is great as Nicholson - a sadly small role for such a great actor (watch him in Poirot sometime). All of this, really, is the episode's B-plot, to give it something to do while the season's big story-line draws to a close. The actual first body in this episode is a heroin overdose found in house full of druggie squatters. Even without Eddie Nero, Oxford's drug crime has not diminished. It's another link to this season's general theme - the search for George Fancy's killer. Strange has been tracking the gun that killed Fancy, which isn't on the records, so Bright and Strange initially assume it came from outside Oxford. They should have been looking closer to home, because once again, we're dealing with corruption in high places. Politician Clive Burkitt seems just a little too perfect. He's also deeply involved in the episode's big historical moment, which was inspired by a real-life story: a collapsed high rise, Ronan Point, in London in 1968. 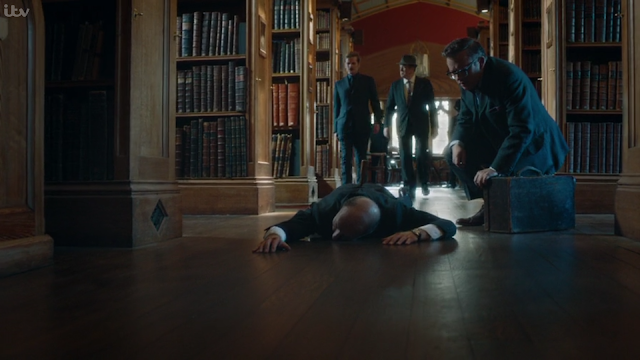 The catastrophic scene in Endeavour is unquestionably this episode's technical high point. It's terrifying and claustrophobic, though the show's budget doesn't feel at all like a constraint in wide shots. Naturally, the collapse wasn't an accident. Corruption is afoot! The disaster served to expose a scandal, but it also exposes a body buried in the concrete a year earlier (it turns out he worked for the council, was poking around into their shady use of adulterated concrete, and was the "H.B." mentioned in the librarian's notes). Morse and Strange are on the case, but things are complicated by the fact that Thursday is on the enemy's side. It turns out he really was taking a bribe for real. The conflict with Win and a lifetime of police service with little to show for it finally got to the old man. The question then, is how to redeem him. 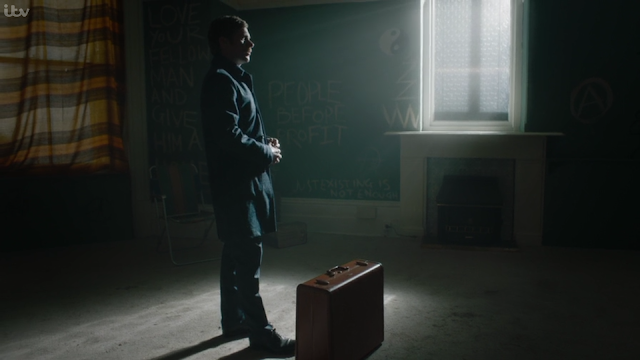 Because at the end of the day, this isn't an episode of Inspector Morse, it's Endeavour. It's an episode that is devoted to restoring these characters to their former glory. 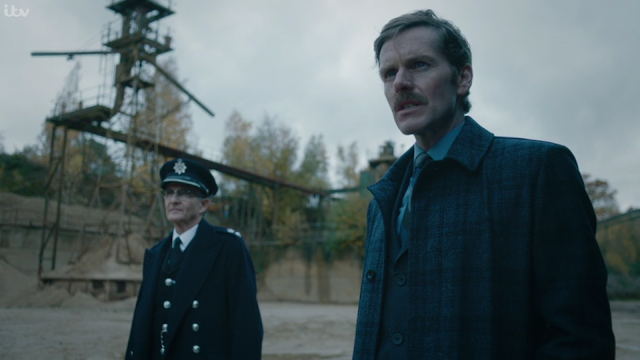 For instance, this is Anton Lesser's finest hour - at least, finest since the Incident With the Tiger. The Masons clearly heard about that Incident, because they send two heavies to kill the little head of Traffic Division in the street instead of slipping something in his tea on the sly. Bright does many awesome things. He runs a disaster scene, gets saved by his kid fans like Indiana Jones in Cairo, sassily defies corruption in high places, rallies the resistance, and is a supportive loving husband to boot. The scene in which he takes charge at the collapsed high rise is particularly good. After a furious bout of competent orders, once he's got everyone else working, he pauses a moment to look horrified and overwhelmed, all on his own, and Anton Lesser, you win this episode. Strange, Max, Dorothea, and Joan are fine, though they're mostly supporting players. Thursday comes to the fore again, as he decides - after a confrontation with both Win and Endeavour - to give the pay-off money back. But it doesn't work that easily. He can't just turn his back on the seedy underworld he'd been sucked into. "It's you or Morse," Box tells him. Damn, I thought. This feels like real stakes again. And it does! This feels like the heady days of season 2. It's like Blenheim Vale, which Thursday references, but if Blenheim Vale had ended happily or ended at all (as you'll remember, it was really left unresolved). Yes, this episode doesn't quite have the courage of its convictions. Fred Thursday gets off far too lightly for all of the corrupt things he's done this season. He beat up an unarmed suspect! He took a bribe! He has gall, acting the white knight in his confrontation with Birkitt, McGyffin, and Box. When he tells them they're villains, he should include himself in the pile, contrasting with his plaintive line, "Morse is an idealist." But the season has been such a dark one that I'm not as bothered as usual about deferred consequences. Everyone has been through the ringer. It's nice to have a rare victory. Looking back over the season, I'm struck more by its stability than its risk-taking. Most of the episodes are meat-and-potatoes Morse stories. But that doesn't mean it's not interesting. Just the opposite, the settled focus has given it a lot of strength. It's felt more dangerous this time - Morse is on the outside, and it suits him. Yes, Fred hasn't been himself, but he hasn't really been himself since season 2. There's been a clear mandate for the season: find Fancy's killer and push Morse farther towards cynicism and isolation. Lewis dropped the Morse-and-Joan story-line, or at least pushed it to the side, which was a great decision - we know Morse ends up alone. Speaking of which, the show now feels like it could absolutely be head-lined by Shaun Evans on his own (it has felt that way for a while, but his isolation within the department demonstrated that concretely). He's gone from strength to strength. Fred Thursday's quivering nerdy little bagman has grown into a hardened and resentful but confident detective. He's a scrawny live wire of a man. He doesn't feel like he should be Fred's second-in-command anymore. He has gravitas. If all the other characters left and he got saddled with a Geordie sidekick, it would work. Morsestache update: I've experienced a strange reversal over the course of the season. I have won victory over myself and come to love the Morsestache. Now, I look at previous reviews and see pictures of bare-lipped Shaun Evans and think, who is this strangely naked young waif? "I'm more of a Holly Martins man, myself." - Thursday, apparently a fan of the cowboy genre, except Holly Martins is a fictional Western writer who's the protagonist of the noir film, The Third Man, so this is all very meta. Morse has moved into his final home. That bitter ending note feels out of place in such a warm, familial ending, but it's a positive sign - the show knows where it's going now. It feels sure-footed and confident again. Bring on Series 7. Hi, Hannah. Agree with everything you say – and have said, since I chanced on your reviews only after rewatching ‘Ride’/Gatsby (and then played double catch-up, re-visiting them all again & reading your comments before this latest series). It’s the warmth that counts, no? You, I, everyone cares because – in spite of the cliches and occasional absurdities – there’s a bedrock of decency. I rewound Thursday’s bribe twice (he can’t? he isn’t! ), though I do think you are perhaps a little hard on him. He’s always walked close to the ‘line’. I feel some of it can be explained, if not excused, by his stress, his weariness – & the accidie that chokes even the best of us as we get old. He had to really taste the bottom, the sick shard of self-loathing, to see and reach again for the light. 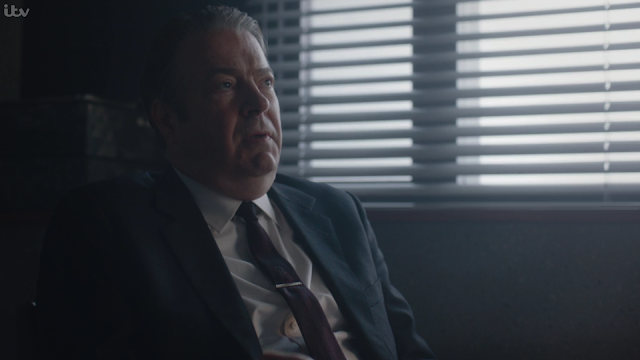 And Roger Allam made me believe that. Could there, can there be a 100th? Maybe 'Sergeant Morse'? Or, even (more meta-nods) 'Acting-Inspector Morse'?? And of course, there's always Hathaway. Tbh, I was really scared Thursday was going to die, which would have been the most redemptive act, Yet I’m not going to dissent. I’ll simply remind you of ‘The Triumph of Despair’. And add (tugging forelock) that I found it uncanny. The ‘desperate depravity’ brought me up short. But, maybe, how we fight for/to the light doesn’t exclude our ducking/diving/dipping in the dark? I found your spitballing charming. I so love that word though, weirdly, a half-American friend had no idea what it meant. But he’s a recent graduated scientist – ‘just the facts, ma’am’. Turns out deguello (with the non chi-chi umlaut my keyboard skills can’t find) means decapitation, or, idiomatically – according to Wikipedia – no quarter/no surrender. I hold my hands up. I really had to wrack my brains to remember what "The Triumph of Despair" was. Reading it now is a bit embarrassing - me, seven years ago! Aaagh. But in general I still hold to that. Thursday, yes, needed a great redemptive sacrifice - a martyrdom, even - to satisfyingly bring him back into the fold. It didn't HAVE to be a martyrdom (though I'm always a sucker for one - I love A Tale of Two Cities), but it needed to cost more than it did. In any case, all of this has inspired me to track down the half-finished essay I once started about Morse talking about faith with a stranger at a pub. Link doesn't appear to be working?